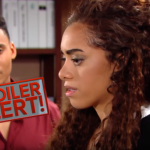 The Bold and the Beautiful (B&B) spoilers for the week of February 4 tease that Liam Spencer (Scott Clifton) will admit that he feels guilty for his daughter’s death. He will confide in Hope Logan (Annika Noelle) that he feels like if he would have been there instead of staying behind, their daughter might be alive. Of course, Hope will tell him that it isn’t his fault. Here’s everything we know about the upcoming B&B storyline. Liam will admit that he feels at fault for their daughter’s death. Hope will try to console him by saying it isn’t his fault. He will explain that he should have told Steffy Forrester (Jacqueline MacInnes Wood) to handle Kelly’s doctor visit alone. He never should have left her to go on the helicopter ride alone. It’s only natural that Liam feels responsible for his baby’s death. As a father, it is his job to protect her. And, he couldn’t do that. While Liam is pouring his heart out to his wife, she admits she has similar feelings. She feels like she is at fault. She worries that there may be something wrong with her and she is unable to have a healthy baby. While the viewers know that Hope can have a healthy baby, it is understandable why she’d think that. The couple vow to talk to each other about their feelings and not grow apart. Hope admits her biggest fear is losing Liam. He reassures her that he loves her and they are in this together. Do you think Liam and Hope can make it? How long will it be before the truth comes out about Beth? Don’t forget to come back later for more The Bold and the Beautiful (B&B) spoilers, news, and casting updates! Make sure to stay tuned to CBS’s “The Bold and the Beautiful” to find out. Don’t forget to check often with Soap Opera Spy for all your latest spoilers, news, updates, and much more.